I am not a tree-hugger. Recycling is about as close as I get to being “natural.” Nothing about me is environmentally sound. I love aerosol hairspray. I consider cosmetics to be a necessity. Even with 4 kids, I used disposable diapers with every single one of them. But this one thing about me kind of makes me feel like a tree-hugger. Here's a picture of our "Bountiful Basket" from last week. We get our produce fresh every week for only $15! It's probably the best $ I've spent on something in a long time. I’ve put my family on a whole foods eating program. This might not be a big deal to some people, but for my family of 6, cooking everything from scratch used to make me want to crawl in bed and not get up. I thought it would be way too much work. Cost way too much money. But that was before I tried it. Like my husband, I grew up on Hamburger Helper, Kraft Macaroni and Cheese, and canned fruits and vegetables. We were from an era where easiest and cheapest was best. I’ve come to find out, that’s not exactly true. Cooking and eating whole foods is so much easier and cost-effective than I ever thought it would be. Here’s my basic plan: I look at every single label on a food item. If I don’t recognize an ingredient, I don’t buy it. After doing this for about 3 months, it’s pretty unbelievable how many unnatural things I was putting into my body. Some of you may think this seems like a lot of work, and for the first month or two, it was. But now that I’m familiar with what ingredients mean (preservatives are the biggest offender) and how to cook whole, it’s actually pretty simple. I’ve even cut my grocery bill by about 1/4 each week. Even my kids and husband are getting on board and recognizing what is the best for their bodies. I drug them away from sugared cereals in June kicking and screaming. But now they’re happy, healthy, and feel great. If my 10-year-old son can do this, believe me, anyone can! The SAHM’s eternal question: Now what? Maybe I should rephrase this into, my eternal question. But from what I’ve learned from friends and social media, most moms feel this way. 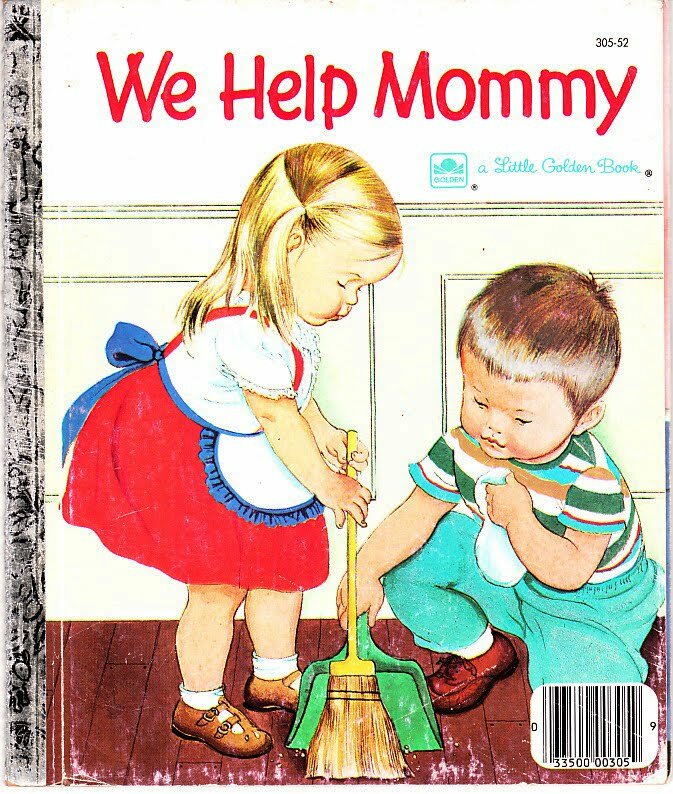 This was my favorite book as a little girl and what helped me know that I wanted to be a mommy. When I was a little girl, I vividly remember day dreaming about being a mommy. Doing laundry and hanging it to dry on the clothes line outside. Walking to the grocery store with my baby in a buggy, the sun beating down on us. Quietly knitting in my rocking chair while my little ones played together in the living room. Even as I got older and held a full-time job, I dreamed about what my kids would look like, what their names would be, how many would I have, and how far apart would they be in age. If life was really like this, who wouldn’t want to be a stay-at-home-mom? And then I had a baby! Life was pure bliss! We did take long walks in the sun. I became crafty. I was mommy machine. Yes, this is what I always dreamed of! But life wasn’t quite complete. Duane and I decided to build our family. Just a little. 19 moths after Audrey, we had baby #2. My long relaxing visits with the sun and stroller became fewer and far between. My craft skills got packed away in my craft trunk. The mommy machine became tired. What happened to the memories and dreams of my childhood? Slowly but surely, I came out of my mommy-coma and started taking care of myself again. It seemed like a long process. In the grand scheme of things, it wasn’t, but at the time, it felt like a forever. Our little family of 4 bought a house, added two more kids plus a dog and a cat. We were big and busy. I learned how to grow a garden, can my goods and cook like a gourmet. Yes, life was good again! But still something felt like it was missing. Just a little piece of myself. Even though I had what I had ALWAYS dreamed of, I felt deprived. I couldn’t figure out why. Thank God for God! I put all of my hopes, dreams, and desires into what HE wanted for me. I learned to be happy. Take pride in everything I did. After all, He created me. I needed to be the best me I could be. Even though I couldn’t quite understand why I felt like something was missing. I had it all. After I learned to actually trust God the way that I knew I should, He began to fill me up with what I needed to feel complete. He revealed to me what was missing. It felt so good to trust God and to know that I was doing what he wanted me to do. I still feel a little envious of the “do-it-all-mommy’s.” You know the kind that get up at the crack of dawn to make eggs and pancakes for breakfast, iron everyone’s clothes before school, have a spot-less house, car, and yard, plus crafts for the kids after school activities, 4 course dinner, and games before bed. That was the mom I thought I was supposed to be. But I’m glad that’s not me. Because just the thought of all of that sounds exhausting. Yes, I still love to garden and can and craft and cook. But my life doesn’t revolve around my kids. It revolves with them. And everyone seems to like things this way! Now, pass me my gym membership and glass of wine and I’m a happy mommy!